Budgeting can be tricky when you have a fluctuating income. With traditional jobs, your income is pretty much set. You either earn an hourly wage and are guaranteed a set number of hours each week, or you are given a salary. To help you obtain more money for your budget and your schooling try to visit the obama student loan forgiveness program. If you freelance, have a sales or commission-based job or run your own business, you won’t really be able to pinpoint what you’ll earn each month, You can try to learn new things to generate income thru longwindcoaching.com. As someone who’s self-employed, my income can vary by hundreds or thousands of dollars each month. This type of situation could mess up your finances if you don’t know how to budget. Yet and still, I’ve been able to pay off my student loans early and save a lot more with this type of income. It just takes a little skill and a clear strategy to make it work for you instead of against you. Here are a few of my budgeting tips for a fluctuating income. If you don’t know how much you’re going to make each month, you can at least come up with an average amount. Take the total amount you bring home each year minus expenses and taxes. Then divide it by 12. Realize that your average monthly income may not reflect what you actually earn from month to month, but it’s a safe place to start when it comes to your budget. For example, if you earn $40,000 per year after expenses and taxes, that comes out to an average monthly income of $3,333. You should create your budget based on that income number and leave a little wiggle room for possible lower earning months. If you plan on spending $4,000 every month, you could end up having a deficit and get into debt. When your income fluctuates, you’ll naturally need to beef up your checking account buffer to protect yourself financially. A checking account buffer is money that sits in your checking account to use in case your expenses run over. This way, you don’t overdraft or have to use credit cards to cover expenses. When your buffer gets low, you just build it back up again. When I first became self-employed, I kept a checking account buffer of anywhere from $500 – $1,000. It’s tempting to want to use that money on impulse buys and extra stuff, but it comes in really handy when you run over on your budget. Trust me, you will run over sometimes. Another account that you want to beef up is your emergency fund. When you have a variable income, it’s important to keep several months of expenses saved up in case you need it. Unexpected expenses will happen. Or if your income suddenly decreases, you don’t want to get stressed out worrying how you’re going to budget and pay the bills. A bares bones budget is just what it sounds like. It’s a budget that is super basic and only includes your actual needs. Expenses like housing, food, transportation and utilities will make it on the list. But, costs like dining out, hair appointments, and even your gym membership probably won’t. A bare budget is pretty boring, but it’s good to have one so you know how much money you need to survive. For me, I know I can cover my basic living expenses with just $1,500 per month according to my bare bones budget. I know that if I at least bring home that much, I can meet my expenses. Anything extra can be budgeted for wants and additional expenses. I’m lucky that I haven’t earned less than my bare bones budget since I became self-employed. But, if you ever find yourself in that situation, you can lean on your checking account buffer or emergency fund. One of the best ways to budget with a fluctuating income is to live on the previous month’s income. I do this and it does wonders for my peace of mind. Instead of getting paid in January and spending that money in January, I hold onto it and spend it in February. How do I support myself during the month of January then? I live on the income from December, the previous month. That way, I know exactly how much I earned and have to work with so I create my budget around that. Sometimes I save more during higher earning months because I have the flexibility to do so using this method. In order to make this work for you, you’re going to have to try to get one month ahead. You’ll have to save enough money to meet your average earning month. Or you can save as much as your bare-bones budget calls for and live very simply the first month. I know it seems like you have to save a ton in order to make budget effectively when your income varies, but it’s worth it. You don’t want to be stressed out about whether you can pay your bills or make your mortgage or rent payment. You want to be over-prepared and have lots saved up. This is why I recommend using all of these tips to maximize your chances of success. Budgeting is a must, and you shouldn’t let your income stop you. Consider lowering your expenses and increasing your income to help you save money faster. The good thing about having a fluctuating income is that you probably have the opportunity to earn much more whether that means getting a new client, improving your marketing to sell more products, or picking up extra shifts and saving all your tips. 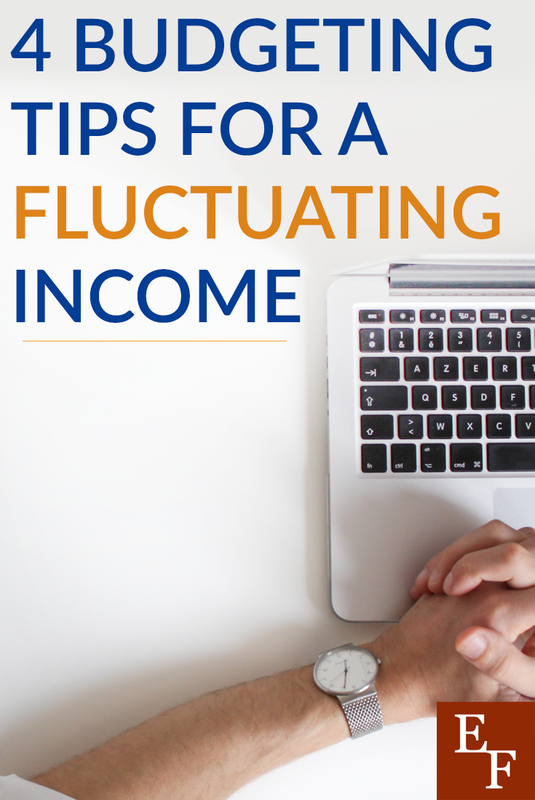 Do you have a fluctuating income? If so, how do you budget?